Important airport features, such as airplanes, runways and terminals (buildings), are routinely monitored by high-resolution aerial and satellite imagery. But flying airplanes can only be observed occasionally due to the relatively small swath associated with each high-resolution image scene. This post discusses the potential of medium-resolution satellite imagery (10m-resolution Sentinel-2) for identifying many flying airplanes over a very large region. Figure 1: London Heathrow Airport. Top: 1om-resolution Sentinel-2 imagery (Tile ID: T30UXC; Acquisition Time: 2016–06–06 11:06:24 UTC). Bottom: 15m-resolution Landsat-8 imagery (Scene ID: LC82020242013157LGN00; Acquisition Time: 2013–06–06 11:00:36 UTC). 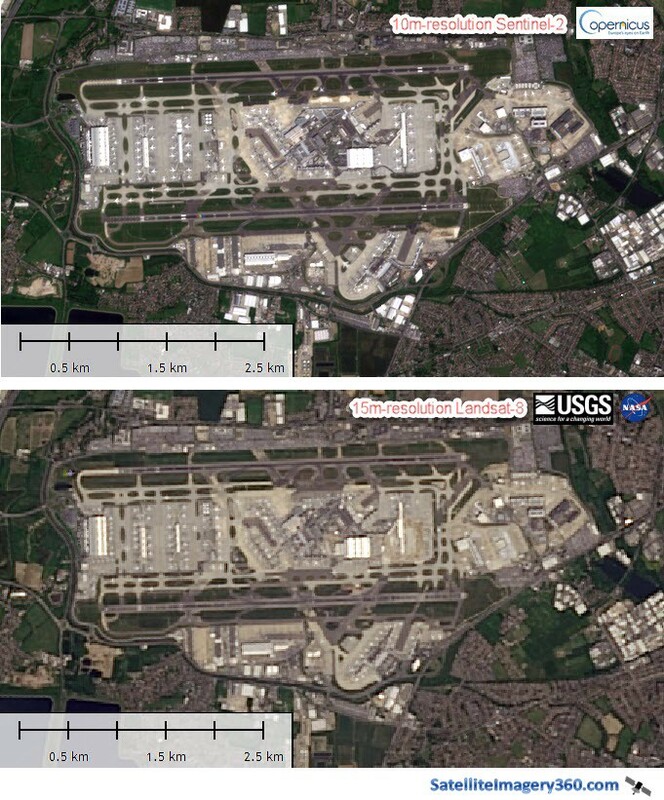 Through this comparison in Figure 1, it is fair to say that the 15m-resolution Landsat-8 imagery is over stretched for identifying airplanes, whereas the 10m-resolution Sentinel-2 imagery can still record sharp and clear shapes of common passenger airplanes resting on airport fields. If the size of an airplane (e.g. small private jets) is too small, obviously the Sentinel-2 imagery would not be useful. The spatial resolution of the imagery is the first most important factor for identifying airplanes, be they resting or flying. Figure 2: Three moving airplanes are identified (within red circles) at the London Heathrow Airport. Source: 1om-resolution Sentinel-2 imagery (Tile ID: T30UXC; Acquisition Time: 2016–06–06 11:06:24 UTC). This is a generic feature for the new Sentinel-2 imagery, but not the Landsat-8 imagery. We explore another Sentinel-2 imagery tile for more vivid examples (Figure 3). Given the identified flying trajectories, relative pixel shifts of flying airplanes across bands (in this case, red/green/blue natural color bands), and the known sensor metadata (such as height, viewing incidence angle, travelling speed and acquisition time gaps across bands), one may be able able to estimate the speed of flying airplanes. Figure 3: A few flying airplanes are identified in a 1om-resolution Sentinel-2 tile near Cologne, Germany (Tile ID: T32ULB; Acquisition Time: 2016–05–08 10:40:27 UTC). 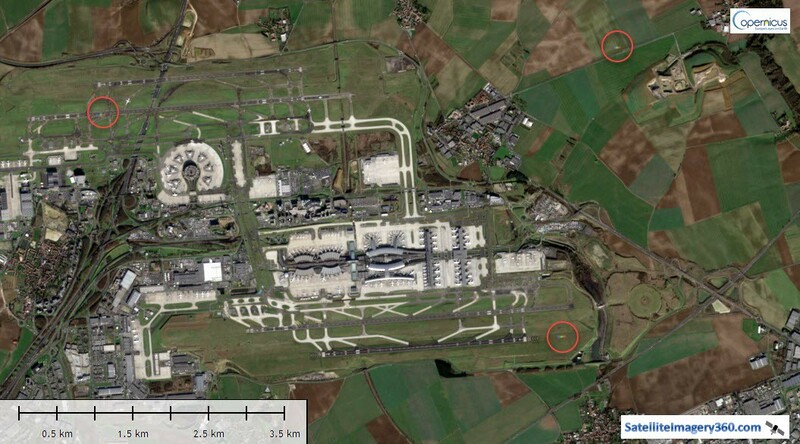 Figure 4: Flying airplanes identified (within circles) in a 1om-resolution Sentinel-2 tile, Charles de Gaulle Airport, Paris (Tile ID: T31UDQ; Acquisition Time: 2016–01–25 11:16:11 UTC). 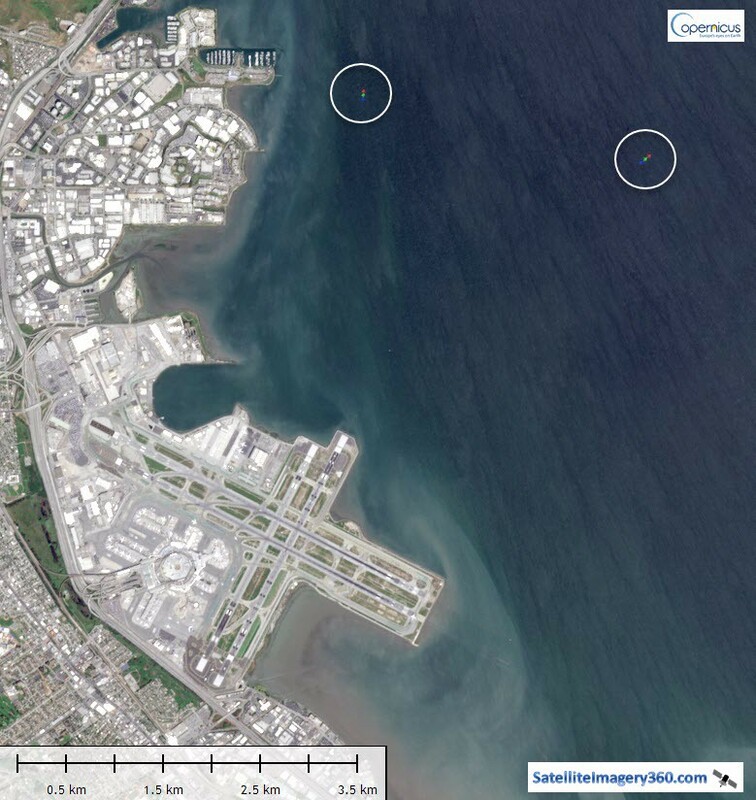 Figure 5: Flying airplanes identified (within circles) in a 1om-resolution Sentinel-2 tile, San Francisco International Airport (Tile ID: T10SEG; Acquisition Time: 2016–04–15 19:03:49 UTC). 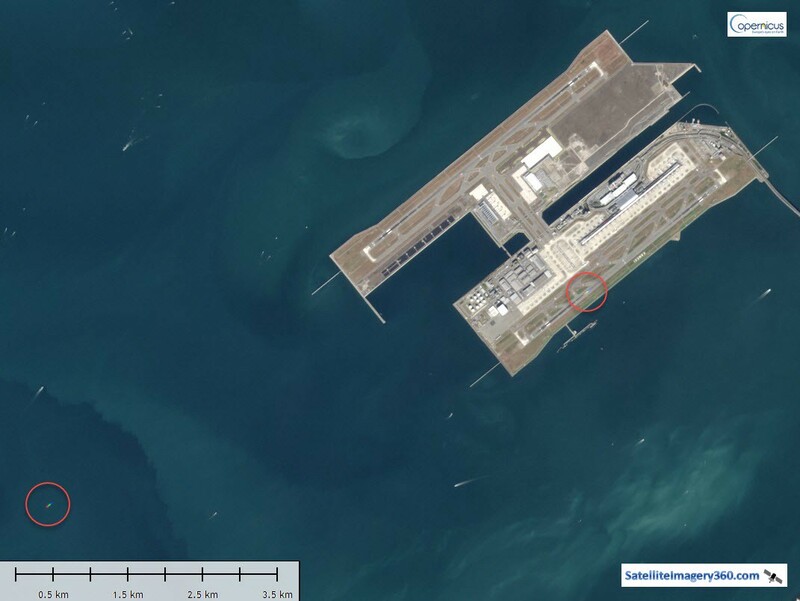 Figure 6: Flying airplanes identified (within circles) in a 1om-resolution Sentinel-2 tile, Kansai-Airport Station, Osaka, Japan (Tile ID: T53SNU; Acquisition Time: 2015–12–08 01:48:38 UTC). Sentinel-2 satellite has a very wide swath (290 km) and a high frequent revisit interval (5 days at the Equator once the twin satellite is to be lunched and operational in 2016/2017). These features, along with the fine spatial resolution of 10 m (for three visible bands and a near infrared band), enable its potential application for identifying airplanes over a very large region. Figure 7 compares swath width among Sentinel-2, Landsat-8, and WorldView-3; in terms of scene sizes, a Sentinel-2 scene can cover ~490 times more areas than that of a very high-resolution WorldView-3 scene. 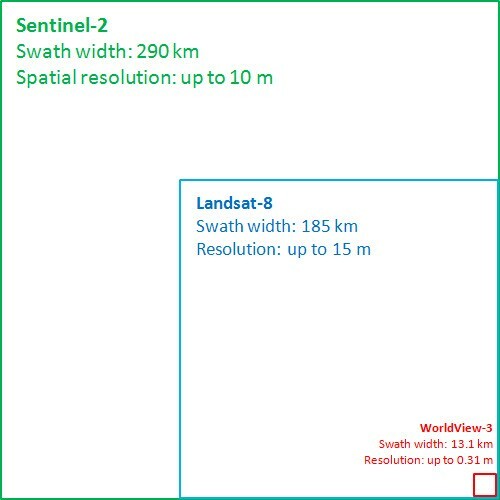 Figure 7: Swath width comparisons: Sentinel-2, Landsat-8, and the very high-resolution WorldView-3. Taking a recent Sentinel-2 tile (about 100 km by 100 km in size) near the Istanbul Ataturk Airport as an example, we can easily identify many flying airplanes (Figure 8). It is done by manual interpretations, a method that is acceptable for this type of special applications. The classified result might be useful for documenting and investigating air traffic, and complementary to near real-time air traffic mapping (e.g. Flightradar24). 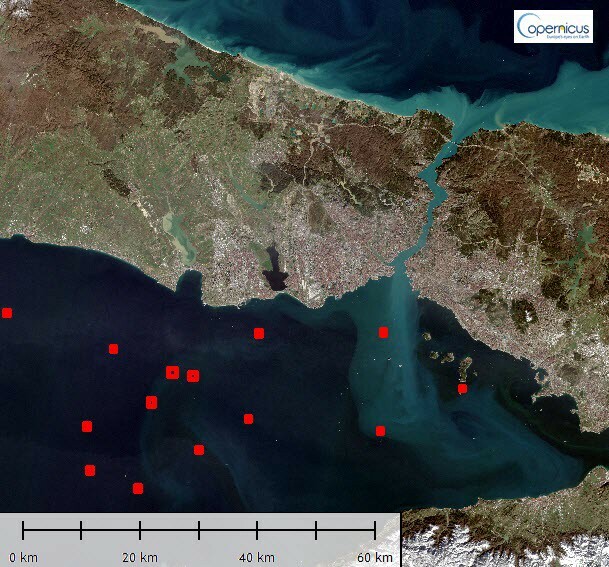 Figure 8: A total of 14 flying airplanes (red marks) are identified in a 1om-resolution Sentinel-2 tile, Istanbul, Turkey (Tile ID: T35TPF; Acquisition Time: 2016–02–08 09:08:16 UTC). A zoomed view is shown in Figure 9, and its full resolution (10 m) picture can be downloaded here. 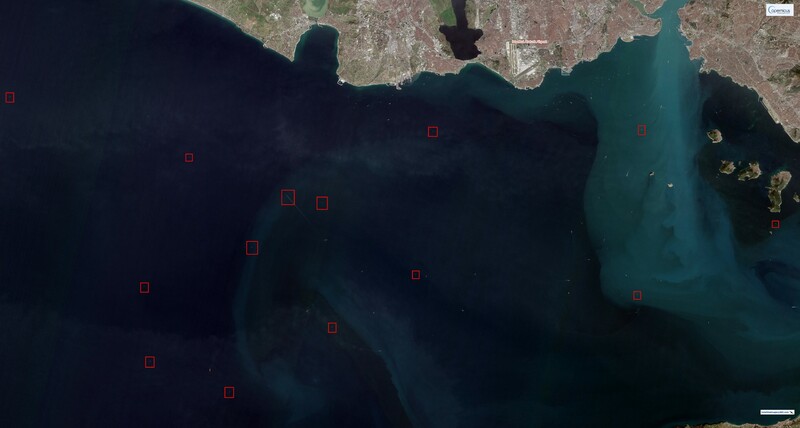 Figure 9: Zoomed view — a total of 14 flying airplanes being identified in a 1om-resolution Sentinel-2 tile, Istanbul, Turkey (Tile ID: T35TPF; Acquisition Time: 2016–02–08 09:08:16 UTC). Developing advanced image analysis software & global imagery basemaps; promoting popular image fusion software for the new, free Landsat-8 & Sentinel-2 imagery.